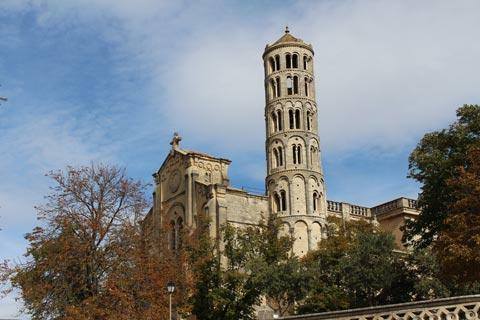 Uzès is a town situated to the west of Avignon and north of Nimes in the Gard department of Languedoc-Roussillon. The centre of this active town is now a protected historical monument, with a good mix of medieval stone houses and fine townhouses constructed later to discover. 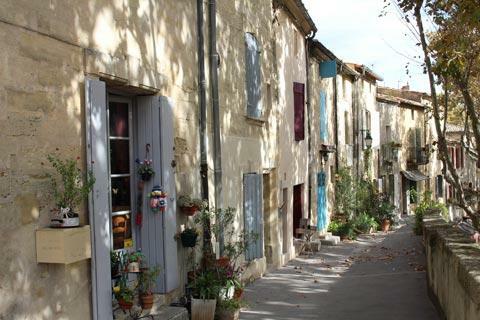 France This Way comment: before visiting Uzès we had been led to believe it was quite a normal, quiet provincial town. 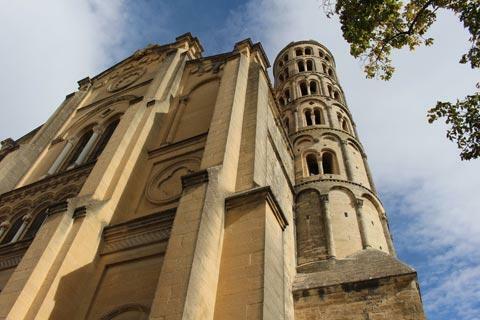 In fact it is very attractive with its large arcaded central square, numerous historic monuments, historic streets and alleys, broad tree-lined boulevards and lovely views across the countryside - one of our favourite towns in southern France and a visit is highly recommended. 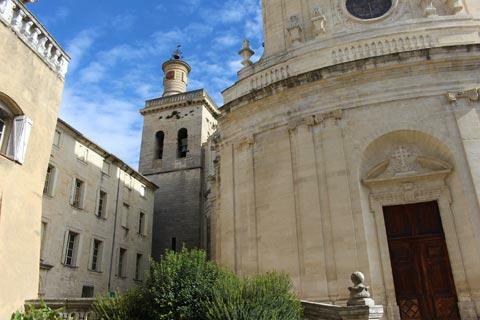 It is easy to find your bearings in Uzès because the town is surrounded by a broad boulevard that completely surrounds the historic centre. We suggest you start at the north in Place Albert because the Tourist Office is here and you can ask for a map of the town that includes all the places of interest and a suggested route to follow as you explore - although the pretty historic streets will tempt you away from the suggested route quite often! The narrow streets of the old town are most noteworthy for the fine 17th century houses, many with ornate iron balustrades, dating from when it was a wealthy textile centre, and for the narrow streets of medieval houses. On your way into the centre you can also see two particularly important townhouses: the 16th century Hôtel Dampmartin (on Place Dampmartin), which includes a tower with a staircase; and the Hôtel de Joubert (on Rue de la Republique) with its beautiful renaissance style doorway and windows. 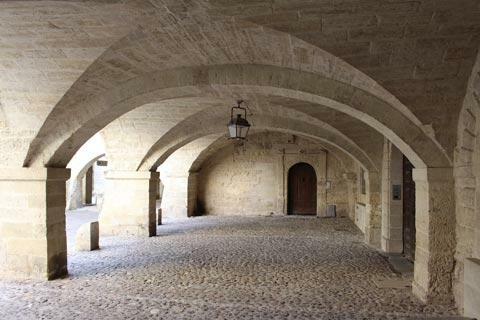 The centre of Uzès is around Place aux Herbes, a pretty square surrounded by attractive stone houses and arcades and with a large stone fountain: the stonework of the arcades with its imposing arches is very impressive. 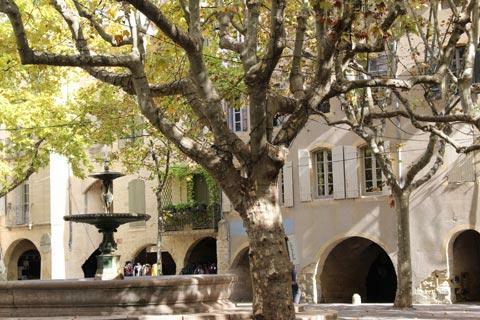 The Place aux Herbes is also the centre for the markets held in the town on Wednesday morning and Saturday all day, and has several cafes so it is a good place to take your morning coffee! 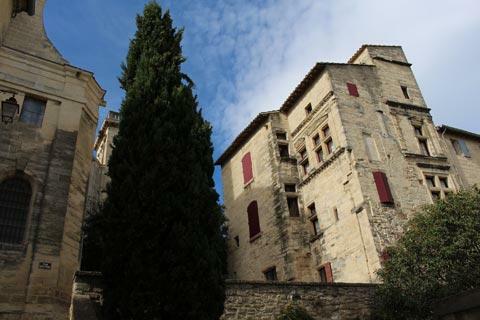 The major monument here in the centre of Uzes is the Duke's Castle, dating from the early medieval period. From the outside the castle walls are dominated by its three towers and donjon, while the interior has been furnished with period furniture and there is a lovely view across the town from the top of the donjon. Entrance charge 17 euros. 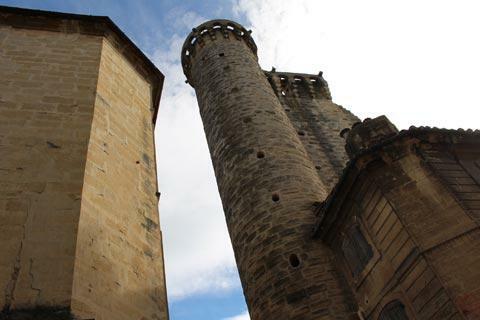 Two medieval towers in the town can be seen in the Medieval Garden: the 12th century Tour de l'Evèque and the 13th century Tour du Roi. 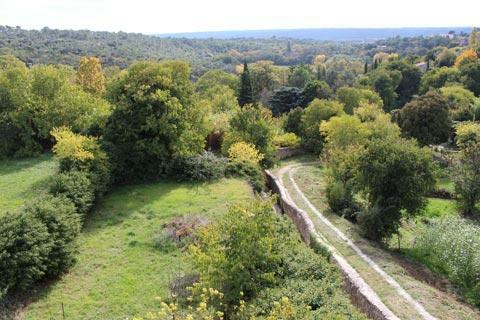 In fact the medieval garden was one of the highlights of our visit to Uzès: the garden itself was quite interesting but it also gives you access to climb the Tour de Roi for amazing views across the town and surrounding countryside. 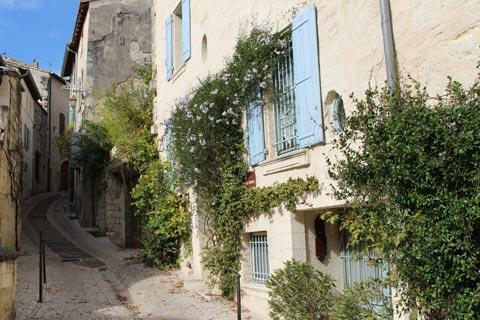 Access to the garden is a little hidden away on the Rue Port Royal in the south of the historic centre. 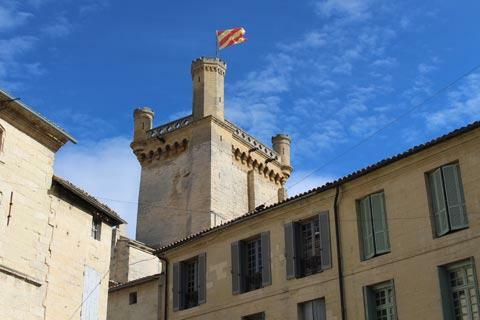 One particular highlight in Uzes is the 'window tower' (la tour fenestrelle) to the east of the centre. 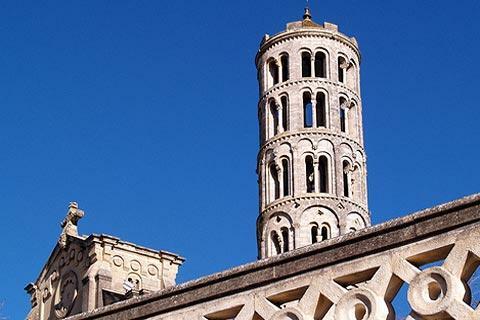 This is an Italian style round stone tower with several pairs of arched windows running up its height that stands 42 metres high and is next to the cathedral. The Cathedral of Saint Theodorit itself was rebuilt in the 17th century, and the facade added in the 19th century. Near the tower you can enjoy very far reaching views across the Eure Valley and also see the Pavillon Racine. 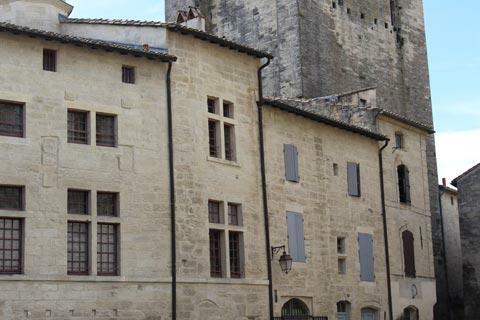 This is a small building with a domed roof that was originally one of the towers of the defensive walls of the town and is named for the famous writer Racine who spent a year in Uzes from 1819-1820 and enjoyed walking here to enjoy the views. 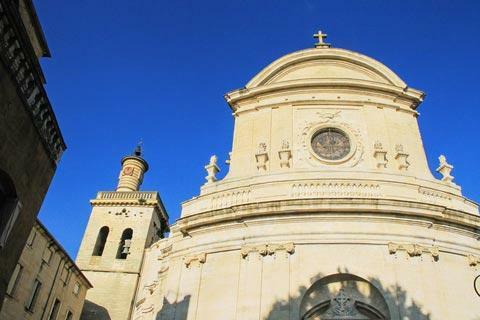 Another church, the 18th century Church of Saint-Etienne, is of interest principally because of its baroque facade and is to the south of the historic centre. 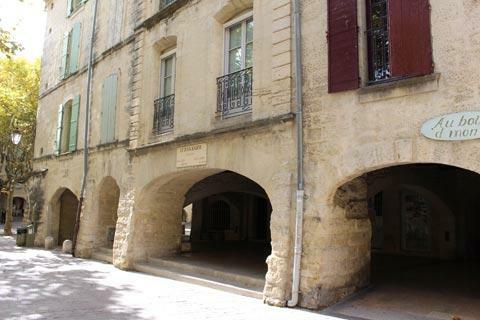 Although we can't list all the interesting buildings in the town we should mention those along the road that leads back into the town from the cathedral, along the Rue Rafin. 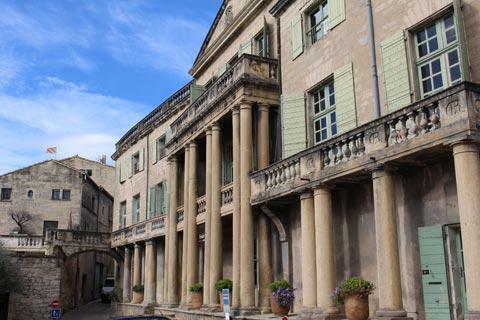 There are several imposing townhouses here from the renaissance period onwards, with the Hôtel des Monnaies and the Hôtel Chambon de la Tour the highlights. 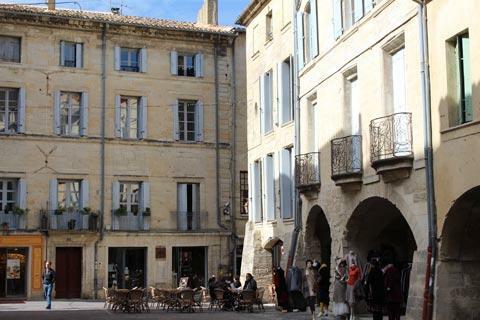 For shopping and a wide choice of restaurants you can follow the broad boulevards - principally the Rue Gambetta - that now surround the medieval centre. If time permits you can follow your walk through the town with a walk through the large park just below the cathedral. As well as the peaceful setting you will also see the Roman aqueduct in the park. North of Uzes, at La Cocaliere (between St-Ambroix and St-Paul-le-Jeune) you can visit one of the most impressive cave systems in France which includes both spectacular rock formations and evidence of prehistoric habitation. Other popular attractions near Uzès include the water park in a lovely natural setting at Bouscarasse (along the road towards Alès); the Museum of 1900 and Toys at Arpaillargues (east); and the Haribo Museum, which celebrates 100 years of the most popular sweet manufacturer in France - one for the children! The Pont du Gard is a famous Roman aqueduct to the south-east of the town, and there are several villages to explore in the region: our favourites are Lussan to the north and Saint-Victor-la-Coste and Saint-Laurent-des-Arbres to the north-east.